Already behind on my #dblogweek posts… Wednesday’s topic is (was!) “Cleaning it out”. I live in a small apartment with my husband and 2 kids. I don’t have the luxury of taking up too much space with diabetes supplies. One thing that helps me keep on top of the stash is that I pick up my insulin and test strips monthly from the pharmacy, so those are never over-flowing. Glucagon is only on my prescription about every 18 months and once replaced, my husband uses the expired one to show me that he remembers how. My pump supplies come by mail every 3 months. When I get my shipment, it’s a bit of a puzzle to store everything at first but changing my infusion set every other day at the moment means that they get used up quickly. But I must purge somewhat regularly to be able to contain my D-supply stash to the plastic storage box beneath my bed. So I have taken this topic very literally as it has prompted me to clean it out. I threw out a full box of manuals for meters I don’t use anymore and I threw out the box that my original Cozmo came in (back in 2003). I threw out bizarre free samples I had received over the years and kept just in case one day I’d have use for them. And I threw out some lancets that had been hanging around for more than a decade. I kept only essentials – well, essentials plus a dozen back up meters (for which I have no strips), a stupid number of old meter cases pump clips, pretty much every log book I have ever written in (which, considering 18 years of diabetes, is relatively few) and a healthy stash of Cozmo reservoirs since when those run out I may actually need to consider changing pumps!! I’m glad to have things tidied up – so thanks for this topic suggestion! 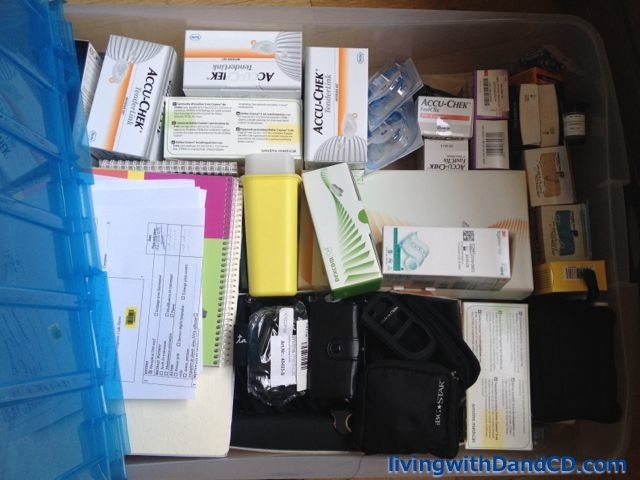 This entry was posted in Diabetes and tagged cases, CGM, glucose meter, insulin pump, lancets, tape, test strips on May 14, 2015 by Andrea. Oh that’s a great idea to have my hubby practice with the expired Glucagons. I never thought of that!